Materials & Applications (M&A) is a Los Angeles-based non-profit cultural organization dedicated to expanding the role of architecture in the public sphere through critical exhibitions and programs. Since 2003, M&A has produced more than 20 temporary site-specific installations and over 100 programs presenting new ideas in art, architecture, and design. Our exhibitions and programs are always free and open to the public. Materials & Applications (M&A) is a Los Angeles-based non-profit cultural organization dedicated to exploring the role of architecture in the public sphere through critical exhibitions and programs. M&A commissions new works that give space to exceptional experiments across multiple disciplines, while challenging the relationship between art, architecture, and public encounters. Through an annual calendar of programs, including installations, performances, workshops, and conversations, we explore how art and architecture can transform underutilized spaces into unexpected encounters. 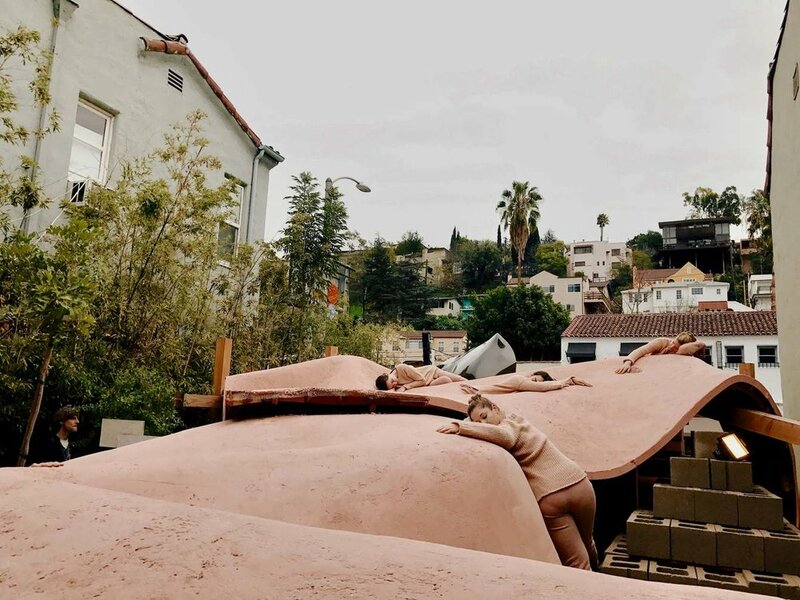 Since 2017, Materials & Applications has left our Silver Lake site and expanding our programming and exhibitions into other spaces in Los Angeles. M&A's mission is to bring new ideas and creative experimentation into public space and public dialogue, and we continue to do so in with the launch of two new spaces: our new office headquarters in Chinatown and the M&A satellite space, a tiny storefront on Sunset Blvd that will allow us to host intimate events and displays (opening in March 2019). We aspire to increase public participation in the built environment by inspiring interest in visitors with their surroundings - while they explore the latest ideas in art and architecture at a critical and experiential level. Our exhibitions and programs are driven by the issues and conversations most relevant to the city today, and are designed to be publicly engaging and accessible. We always initiate our projects with an idea or an inquiry and proceed from there. We develop our exhibitions and programs in collaboration with invited artists and architects through sustained conversations about formats, event types, selection of artists and architect teams, financing, schedule, and production. Since 2003, we have produced over twenty site-specific installations embedded in the residential landscape of Los Angeles. We take underutilized spaces in the city and transform them into temporary pocket parks through the commissioning of new public art and architecture. We invite the public to participate in the construction of our projects in the form of participatory building workshops. Past projects include a temporary mini-golf project, a golden vortex in Silver Lake, a dance party in a giant bird cage, a conversation on how buildings can own themselves, a cake-off, a publication launch party, an instructional performance on urban hideouts, an investigation into zoning and its applications, a reading group on the picturesque, and a one-day foam environment installation. All our projects are not-for-profit and we aspire to present them for free. Very rarely, we will solicit donations as entry. We love to collaborate. It is of special importance that we develop ideas jointly with our partners, and create dialogue between our organizations, partnering artists or organizations, outside experts, and our audiences. Our past institutional partners include Armory Center for the Arts, Cal State Long Beach Art Museum, Getty Pacific Standard Time, Mak Center for Art and Architecture, LA Forum for Architecture, Neutra VDL House, Council for Watershed Health, the Los Angeles Poverty Department, Common Field, Human Resources, Women’s Center for Creative Work, and 2426 Set amongst others. Materials & Applications was founded in 2003 as a collaborative space for experimentation and research in the parking lot of a Los Angeles home. The core team was composed of Jenna Didier and Oliver Hess, with important contributions from Bruch Chan and Brian Janescko. Propelled by a community of artists, architects, and designers, Materials & Applications remains one of the only independent spaces for art and architecture in Los Angeles that is dedicated to foregrounding contemporary ideas through one-to-one architecture. From 2003-2016, Materials & Applications was based in our Silver Lake courtyard. Today, our projects are itinerant and take place in landscapes, sites, and spaces throughout Los Angeles. Since 2015, M&A has been helmed by Jia Gu (Director) with a generous team of part-time staff and volunteers, and support from the Board of Directors and the Contemporary Council of M&A. "One of Los Angeles’ most vibrant creative cultural centres, the Materials & Applications exhibition space is redefining what an architecture gallery can be. Part architecture gallery, part public art display, and part workshop for experimentation and learning, the venue provides an outdoor exhibition space for new architectural ideas, while inviting the public to participate in creating its installations." Gwyneth Shanks, From Above | Looking Down, 2017, Los Angeles. Courtesy of the artist.